Eventer Lucinda Green needs no introduction, being the heroine of many of our childhood equestrian dreams! What you may not know is that Lucinda once lost her pony to equine grass sickness, and this cause is close to her heart. Lucinda has very generously offered a place on a group course walk at Burghley Horse Trials on Friday 2nd September 2016 in aid of grass sickness research. This prize is being auctionned as part of Yvonne Maclean’s 2016 fundraising effort, which will culminate in the Ross-shire EGS and Laminitis Fun Show. To bid for this fabulous prize please visit Yvonne’s Facebook event page, or if you are not on Facebook you will need to be very nice to someone who is! (Please note you will also need an admission ticket to Burghley). Yvonne also has dozens of fabulous raffle prizes generously donated by supporters. You can see an up-to-date list of the prizes and how to buy tickets on the above Facebook page. And as if that wasn’t enough Yvonne is also organising the EGSF raffle at the Royal Highland Show this year. 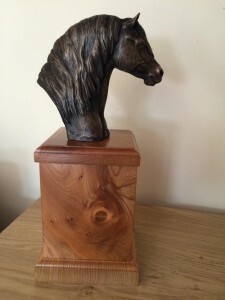 So far there are tickets to Olympia (Thursday afternoon performance) and a stunning sculpture of a Highland Pony’s head by Liz Henderson to be won. To enter this raffle you must purchase tickets at the EGSF stand at the Highland Show near Edinburgh in June.